Happily Unmarried store is for young generation. The products offers are vibrant and are according to the needs of young minds. 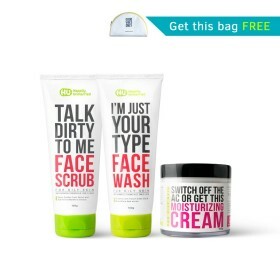 Buy HU girl body care- Pack 3 at just Rs 999/- + Get a bag/kit free. Body lotion - CottonSeed & Plum: A high on moisturization light body lotion, for all skin types! Not sticky & non-clingy, just how your man should be. Body Wash - Lavender & Vetiver : A high-foaming sulfate-free body-wash with pure extracts of Lavender, Indian Vetiver, Aloe Vera and Soy Proteins, this body wash helps in moisturization, nourishment & has anti-oxidant properties too. Body Mist - Not Pink : Not Judging, Not Stereotyping, Not Pink! Get these amazing skin products that include 3 products only at Rs 899. Limited period offer. So shop Asap! Buy Hu Girl Pack of two at Rs 899. Get a handy travel kit worth 599 free with this pack. Book your order before offer gets expired. Happily Unmarried is a company that was started in 2003 in Delhi as a motive of providing fun products to their customers. Initially, the target was to provide products for a single person. All of their products, as well as the website, is very dramatic and full of humor. They provide the items like beer mugs, shot glasses, funny printed shirts and many more. All of their stuff had funny and dramatic quotes written on shirts, bags, key chains, door mats, glasses, and other products. Happily unmarried company was initially started to spread fun with the customers. Then they start making strategies to increase the business, grab attention from customers and make them happy buyers. The products they sell are of the best quality and one of a kind. They used innovative ideas and print the product with funny quotes. They offer all types of fashion, accessories and homeware items at low prices that a single man should afford. Fashion Accessories: This may include the latest fashion accessories such as bags, keychains, wallets etc. Clothing: This includes T-shirts, sweaters and more with printed funny quotes on it. Gifts: Including mugs, gadgets, diaries and much more. Homeware: In this category, you may get cushions, doormats, kitchenware, magnets and so on. Tech cases: Including Samsung, iPhones, and more. Apart from all the above-written categories, there are many more that you can get. Just check out the latest Happily Unmarried deals and get the offers. This website comes up with the unique and funny gifts idea for every occasion. They have a wide range of varieties to choose from like t-shirts, mugs, Beer mugs, cups, and much more other stuff. Their unique idea of gifting products gathers the attention of the buyers. The products that they provided surely bring a cute smile on your someone's special face. Once you visited this website you will surely get attracted by their unique gifting products. Use Happily Unmarried coupons and offers to save more. The products of Happily unmarried can be availed at various discount offers. Dealsshutter lets you get the regular offers and coupon codes provided by Happily Unmarried. All you have to do is to get the offers at Dealsshutter and select the best appropriate offer for you. Use the Happily unmarried coupons, Ustraa coupon code and get an amazing discount. Make your life fun filled with products of Happily Unmarried!